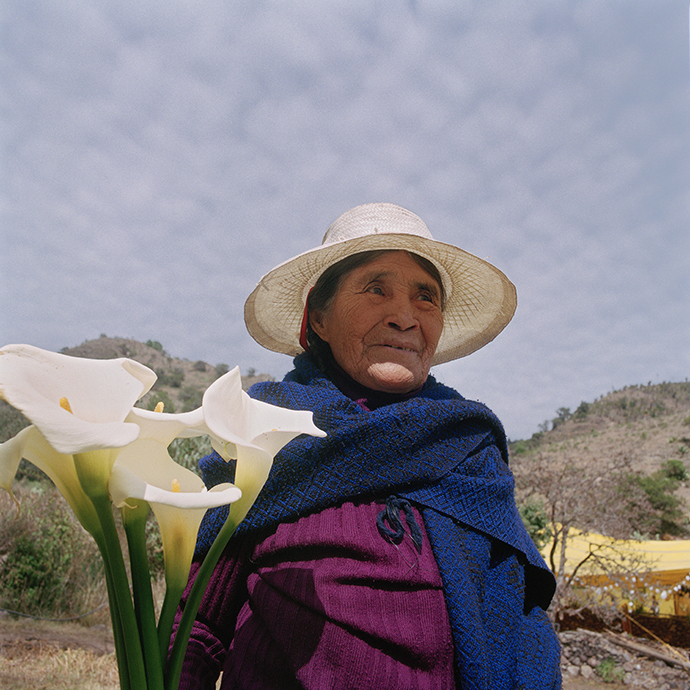 October 27, 5:30 to 7 p.m.
Catalina Alvarez with her Calla Lillies, Xonocatla (Catalin Alvarez con sus Alcatraces, Xonocatla), 2005, color photograph by Laurence Salzmann; Catalina is on her way to her grandson Adan’s wedding in Xonocatla, Puebla State, Mexico. Part of the exhibition “Echele Ganas (Do Your Best): A Life Left Behind, Photographs and Film by Laurence Salzmann” at the Tufts University Art Gallery, Medford, MA, through December 19, 2010. MEDFORD, MA – On Wednesday, October 27, 2010 from 5:30 to 7 p.m., noted documentary filmmaker and photographer Laurence Salzmann will screen and discuss his most recent film Echele Ganas (Do Your Best): A Life Left Behind in the midst of his eponymous exhibition inside Tufts University’s Aidekman Arts Center. The one-hour film and exhibition portray the ways of life of villagers in the mountainous region of La Sierra de Norte in the Mexican state of Puebla. Photographic portraits and filmed interviews document traditional village life left behind by workers who have emigrated north from several villages in Puebla state, particularly to the Philadelphia area. Cultural and religious events, such as weddings, saints’ day celebrations, first communion, Quinceañeras, and the preparations for them, are presented in this first-ever exhibition of ten color photographs and a video montage from the eponymous film. Salzmann’s exhibition is curated by Tufts University Art Gallery Director Amy Ingrid Schlegel and runs through December 19; a concurrent exhibition, Mexico Beyond Its Revolution, runs through November 14. All events at the Tufts University Art Gallery are free and open to the public. Documentary photographer and videographer Laurence Salzmann has worked with local communities in Turkey, Romania, Cuba, Philadelphia, New York City, and, most recently, from 2004 to 2008, in the mountainous region of La Sierra de Norte, Puebla State, Mexico. Trained as an anthropologist, he has been actively engaged since the late 1960s with the communities whose stories he tells, making multiple, extended trips over several years and working without a translator. Salzmann’s goal for the “Echele Ganas” project is to create a collective portrait that will inform the American public about who these immigrants are and what their lives were like before they began their journey north. The underlying goal of Salzmann’s work is to foster a deeper appreciation of Mexican cultural heritage and humanity and to validate their need to provide a better life for themselves and their families by immigrating to the United States. For more information and images about this project visit: www.echeleganas.com. Mexico Beyond Its Revolution, organized by the Tufts University Art Gallery and on view concurrently, presents a thematic examination of Mexican art from the past century comprised of 38 artworks by 24 Mexican and Mexico-based artists. In recognition of this year’s centennial of the Mexican Revolution, which began on November 20, 1910, and also the bicentennial of Mexico’s independence from Spain, declared on September 16, 1810, guest curator Adriana Zavala, associate professor of art history and director of the Latin American Studies Program at Tufts, has woven together a multi-media exhibition with photographs, works on paper, paintings, sculpture, and video to elucidate Mexico's revolutionary transformations over the 20th century. The selected works exemplify how these artists have lived and expressed the “Revolution” in all its permutations as well as the ways that art and the Mexican nation have transcended the Revolution. A fully-illustrated, bilingual catalogue for both exhibitions is available for $10 (excluding shipping and handling) and is free for Tufts I.D. holders. The Tufts University Art Gallery animates the intellectual life of the greater university community through exhibitions and programs exploring new, global perspectives on art and on art discourse. The Gallery is fully accessible and admission is free ($3 suggested donation). Gallery hours are Tuesday through Sunday, 11:00am to 5:00pm & Thursdays until 8:00pm. Free event parking is available in the lot behind the Aidekman Arts Center, off Lower Campus Road. During regular visitor hours, there are four free Gallery visitor parking spots in the gallery parking lot.